Transparency Market Research announces the release of a new research report titled “Aerosol, SPF and Aerosol Propellants Market - Global Industry Analysis, Size, Share, Growth, Trends and Forecast, 2013 - 2019”. The report indicates that expanding at a 5.10% CAGR from 2013 to 2019, the global aerosol, SPF, and aerosol propellants market is projected to grow from a value of US$16.4 bn in 2012 to US$23.2 bn in 2019. The global aerosol, SPF, and aerosol propellants market is fueled by rising consumer wareness towards personal hygiene and health, development of the aerosol market, frequent product launches, and development of eco-friendly products. However, numerous health and environmental hazards associated with the use of propellants in aerosol are likely to impede the growth of the aerosol, SPF, and aerosol propellants market. On the basis of product, the aerosol propellants market is segmented into hydrocarbons, CFC, nitrous oxide and carbon dioxide, and dimethyl ether (DME) and methyl ethyl ether. 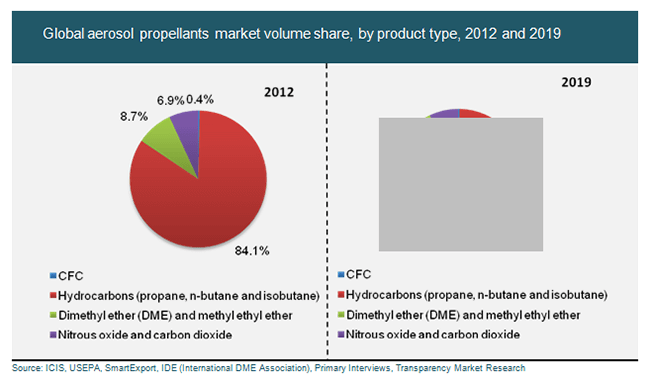 In 2012, hydrocarbons including n-butane, propane, and isobutane dominated the aerosol propellants market, holding a share of over 80.0%. Methyl ethyl ether and DME have also been gaining popularity owing to their eco-friendly nature and their ability to offer replacement value for traditional hydrocarbon propellants. By application, the aerosol market is divided into medical, paints and coatings, household, and others. Household was the largest application segment in 2012, accounting for over 50.0% of the market that year. Propelled by new product launches that provide convenience and efficiency to consumers, this segment is anticipated to continue dominating the aerosol market through 2019. The medical and paints and coatings segments have been showing promising growth over the past few years and these segments are likely to register a CAGR of more than 4.0% from 2013 to 2019. The others segment of the aerosol market includes applications such as auto care, food, industrial sprays, and veterinary, and this category is projected to lose market share over the next few years owing to stringent regulations pertaining to the use of propellants in aerosol products. On the basis of geography, the global aerosol, SPF, and aerosol propellants market is segmented into North America, Asia Pacific, Europe, and Rest of the World. In 2012, Europe emerged as the dominant regional segment, accounting for a share of 35.70% in terms of volume consumption. This region is projected to retain its lead throughout the forecast period. North America is the second largest market for aerosol, SPF, and aerosol propellants, accounting for a share of 30.70% in 2012. Even though the Asia Pacific aerosol, SPF, and aerosol propellants market is currently developing at a sluggish rate, analysts predict that this region will emerge as the most lucrative market by 2019. The aerosol, SPF, and aerosol propellants market is led by a number of leading players such as AkzoNobel NV, BOC Industrial Gases UK, Honeywell International Inc, Royal Dutch Shell plc, National Gas Company S.A.O.G, Bayer MaterialScience AG, Lapolla Industries Inc, Aeropres Corporation, and AVEFLOR, A. S.